Newspaper Museum In Collinsville and the other advertisers appearing on these pages. If you would like to provide content or advertisements ... call Ted Wright (918) 371-1901 or send email to wrightted@aol.com. 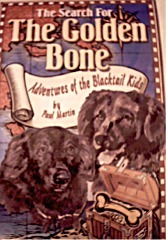 Dallas author Paul Martin brought his dog Angel (a former stray) who is one of the main characters in his first full length book: "The Golden Bone, Adventures of the Blacktail Kids". Mr Martin has written text books before but used this book to combine his interest in animals and geography in a format for kids from about 9 to 14 years old. The story (in the dog's voices) traces the trip of two dogs from East Texas to the East Coast of the U.S. and then north and back through New York and the Great Lakes and then back down to Missoui. This is the first of a series of books planned by Mr. Martin to cover different geographical regions with his animal characters. The initial book will be released next Tuesday (Dec. 9th) and will be available online through most major book sites. 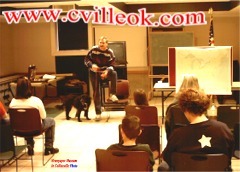 Mr. Martin and Dr. Susan Babbit both stressed the need for improvements in animal shelters. 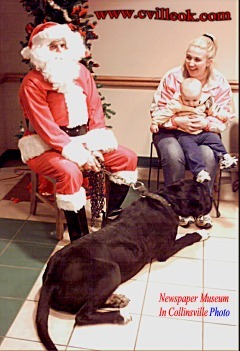 Even Santa brought his dog to the Library Saturday Dec. 6th. Susan is forming a local group to bring about improvements in Collinsville. 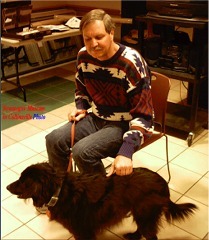 Mr. Martin hopes that his books do well enough to help raise funds for animal shelters nationwide.